The future Archpriest Vladimir Tyshchuk was familiar with the problems and joys of Russian priests’ ministry outside of their motherland. His father, the famous Mitered Archpriest Arkady Tyshchuk from Moscow, carried out his ministry in Japan, Bulgaria, and the USA for about twenty years. Fr. Vladimir completed a degree in Foreign Languages at Teachers’ Training Institute in the city of Vladimir. In 1989, he was sent on a mission to New York City by the Moscow Patriarchate’s Department for External Church Relations (DECR) as Secretary of the Administrator of the Patriarchal Parishes in the USA. 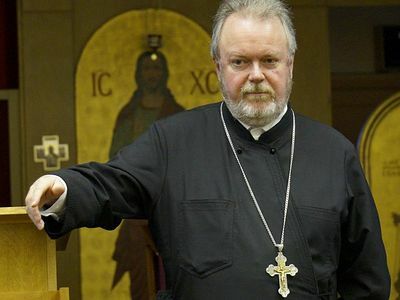 In 1991, he was ordained a deacon in America, and later, in 1998, he was ordained a priest by the then Bishop Pavel of Zaraysk, Administrator of the Patriarchal Parishes in the USA (now Metropolitan Pavel of Minsk and Slutsk, Patriarchal Exarch of All Belarus). Since 2002 Fr. Vladimir has served as Dean of St. Nicholas Cathedral in Vienna (Austria). St. Nicholas Cathedral in Vienna was built between 1893 and 1899 as the Russian Embassy’s church with charitable donations, and Emperor Alexander III made the largest contribution. The twentieth century’s tumultuous events sealed the fate of the church which was closed down after the beginning of the First World War; its building was confiscated by the German administration during the occupation of Austria by Nazi Germany. Following Vienna’s liberation by the Soviet Army in May 1945, the church was returned to the Patriarchate of Moscow. With the establishment in 1962 of the Diocese of Vienna and Austria St. Nicholas Church was granted the status of a cathedral. Fr. Vladimir Tyshchuk has shared his memories of his father and told us about the specifics of priestly ministry far from one’s motherland, and the parish and parishioners of the cathedral in Vienna. —Fr. Vladimir, you were born to the family of the renowned Moscow pastor—Archpriest Arkady Tyshchuk. Please, tell the readers about him and how he influenced your life. —My father was a wonderful person. When we, his children, were small, our communication with him was very limited. Actually, he had no time for communication with us! He poured all his being into the church and the representative duties that the Church hierarchy entrusted him with. Our mother was his faithful helper and she devoted all of her free time to us, her kids. I well remember that dad never raised his voice as a parent! But whenever he made even a subtle change in his tone of voice, we understood immediately that we had done something wrong. When I became a priest, my dad told me a lot about his ministry, and the interesting people and meetings, the memories of which remained in his heart forever. —Could you share one of these stories with us? —One of these wonderful stories took place in Kirzhach [a town in the Vladimir region, central Russia], where my father was transferred from Klaipeda [a port town in Lithuania]. On the day of his arrival (and Fr. Arkady came without his wife and children to provide the house with necessary facilities), an old woman came to him in the evening and said that a nun from Kirzhach had sent her to him. The nun in question, Mother Seraphima, had seen St. John of Kronstadt in a dream the night before—the saint said that a young priest was coming to the town and would give her Communion thenceforth. The aged nun’s face was disfigured by a type of lupus called lupus erythematosus and it was impossible to look at her without horror. Mother Seraphima recounted this remarkable story; Fr. Arkady later retold it to me, and it was imprinted on my memory. When Lidia (Mother Seraphima’s secular name) was born with this rare skin disorder, her mother was devastated. Since the doctors were helpless, her mother pinned her hope on prayer. Once she was told that a train with Fr. John of Kronstadt on it would pass through their town; this news filled her heart with hope. Fr. John was venerated as a man of prayer and wonderworker even in his lifetime. On the appointed day the woman took Lidia and made for the railway station, hoping that her daughter would be healed. But on her arrival she was totally disappointed. The small station was surrounded by a throng (around 5,000 people), and it was clear that she wouldn’t be able to see the great pastor, let alone speak to him. Meanwhile the train pulled in. The coach door opened, and the holy archpriest, standing on a step, blessed the people on the platform—and when they inclined their heads, he suddenly pointed at Lidia and her mother and said loudly: “Servant of God Lidia! Come here with your mother!” The people standing closer to St. John turned around, while the pastor repeated his words in a loud voice: “Servant of God Lidia! Come here with your mom!” The crowd parted to let them pass. When they came up to Fr. John, he said to Lidia’s mother that her girl won’t be healed! Instead, she would become a nun, and through her suffering and spiritual labors many people would be delivered from their sins. Thus, the same Lidia—that is, Nun Seraphima, told this story to Fr. Arkady who came to give her Holy Communion. There were many such stories, and it is impossible to recount all of them. —That’s amazing! Were there any memorable stories from missions abroad? —Let me tell you a story about our Church diplomacy, this time a funny one. Fr. Arkady opened a podvorye [a representation church] of the Russian Orthodox Church in Tokyo in the 1960s, and he lived there for altogether over seven years in two missions. I accompanied him in that first mission. After three years had elapsed, our mother returned home with us to prepare for the next mission (this time my dad was sent to Sofia). Fr. Arkady was going to hand over the office to two archimandrites—Serapion and Irinei. Taking office is a labor-intensive and long process in Japan. One needs to learn a lot: how to celebrate services in Japanese using the transcription, how and where to buy such-and-such things, how to draw money from a bank account (for maintenance costs) and so forth. A week before Fr. Arkady’s departure from Tokyo the archimandrites asked him: “Fr. Arkady, can you fill in your bank check again so that the money could be issued in big banknotes? Otherwise 500,000 yen will require a bulky bag.” Fr. Arkady filled in the check and they went to the bank on their own. To their great amazement, they brought back two packages full of money! Amid general rejoicing it turned out that there was five million yen—ten times more than the sum requested. They joked around about all gifts that they could purchase for the Mission and themselves with this “money to burn” and then went back to the bank to return the surplus, which they understood to be a mistake. However, the bank employee didn’t want to take the money, saying that he couldn’t make a mistake. Half an hour later they at last persuaded him to accept the money. In the evening, pale and perplexed, he was standing at the doorstep of their office and pouring out his thanks. If they hadn’t given back the money, the man would have had to work for free for the rest of his life to clear his debt. Fr. Arkady took me on three of his missions when I was a boy, namely to Japan, Bulgaria, and the USA. I held a double candlestick in my hand for the first time in Japan when I was about five. I remember that after the service Metropolitan Nicodemus (Rotov) would remove wax from my hair that had spilled on my head during the Liturgy. From my childhood I used to help my father in the altar, and the example of his ministry is always seen in my mind’s eye. —In 1989, you were sent on an assignment to New York City as Secretary of the Administrator of the Patriarchal Parishes in the USA. Can you tell us about this ministry? —Since I spent all my childhood overseas, a mission to or ministry in America was something I could not have dreamed of. Quite the contrary: this kind of ministry imposes constraints on you that you would never experience in your own country. Thus, the decision to send me to the USA came as a rather undesirable surprise for me. I was young and liked my work in the Department for External Church Relations; I liked my co-workers and “teachers” there. In the USA I was a secretary, a subdeacon, a cell-attendant, a driver, and an interpreter simultaneously—these were my obediences. At one time I even performed the task of being the bishop’s cook for three months. Though it may sound ambitious, it was all part of my life. I must confess that the quality of food I gave to the bishop was much lower than the norm. On arriving in the USA I quickly mastered computer technology—that was the time when computers were being assimilated into daily life the West. Metropolitan Clement of Kaluga and Borovsk set a good example in this respect. Thanks to his inquiring mind he became one of the first hierarchs of the Russian Church to realize the advantages of computers in office work. I couldn’t have imagined that my stay in the USA would be extended and last ten years, at a time when priests were normally sent abroad at the most for three years. Meanwhile, less than three years after my departure, my own country, from where I was sent on mission [the USSR] ceased to exist. —What was your personal impression of America and its people? —The USA as a country and its Orthodox residents left an indelible impression on me. At that time, Russian-American relations were generally warm. Unlike other diplomatic mission representatives, as representatives of the Church we were not even subjected to travel restrictions beyond the twenty-five-mile zone around the city of residence. Our parish was growing very rapidly. We had to think about how to help our compatriots who were flooding into New York City during those years and who often got in trouble. —You studied at the Department of Theology of St. Tikhon’s Orthodox Theological Seminary (South Canaan, Pennsylvania). What can you tell us about your studies there? —I was a non-resident student. Students of the same class would tape lectures for me, and I would listen to them during my long journeys with Bishop Pavel across the vast expanse of the United States, and then I took exams. Sometimes I had five or six exams in two to three days—the period for which the bishop allowed me to go back to the seminary. I am so grateful to him for facilitating my studies. With all my numerous duties at the Representative Office, Bishop Pavel was left without help every time I was absent taking my exams. I liked English lectures very much. My favorite subject was dogmatic theology, taught by Prof. Harry M. Boosalis, a graduate of Oxford University. Since all lectures were taped, I was able to listen to them several times. We asked our teachers’ permission to tape their lectures. Church history exams stuck in my memory. By the way, we only had written examinations at St. Tikhon’s Seminary. History exams consisted of two parts. The first one included a total of around forty dates and names. Our teachers would highlight ten names and ten dates, and we were expected to give three important facts or events relevant to each of the highlighted dates or names. The second part was a number of essays. Ten subjects for essays were printed out, and four of them were highlighted by the teacher. We were expected to write down a detailed plan of the essay on each of three highlighted subjects and to write a full essay on the fourth subject. —You lived in America for ten years. Can you say that your spiritual formation took place in that country? Did you feel that you were serving in an “alien land”? —No, I didn’t have this feeling. All the talks I had with Bishop Pavel during our long journeys by car across the country remained in my memory forever. I believe he played a key role in my spiritual formation. These were talks about the holy elder Sebastian of Karaganda, the Pskov Caves Monastery, the Russian Orthodox Ecclesiastical Mission in Jerusalem, and so on. His Eminence has been a model for me to follow. For example, would begin reading all letters he received starting from the end (and I think he still does). If he found that the signature was missing, he would immediately throw the letter into a trash can. Thus, despite the fact that I performed my obediences abroad (where I have lived for thirty-five years now), my personality developed under the influence of examples from our Mother Church, passed down to me by my parents and the hierarchs that I met and worked with on my life’s path. —Since 2002 you served as Dean of St. Nicholas Cathedral in Vienna. How did you react to the new assignment? After all, the language and culture are different in Austria. —It was His Holiness Patriarch Kirill of Moscow and All Russia (then the DECR Chairman) who blessed me to go to Austria. Actually, Austria was not the “country of my specialization” in linguistic terms, though German was my second language at the institute. Before the appointment I had served at St. Catherine’s Church in Vspolye, Moscow, and Fr. Oleg Kirillov who also served there, tried to “take the wind out of my sails” before my departure for Vienna, saying that there were many problems and I wouldn’t be welcome in that country. But my father taught me not to discuss the decisions of the Church Hierarchy with anybody and not to ask permission to go and serve somewhere else. So all I could do was rely on the will of God and the decision of His Holiness. —What did you have to face in the first stage of your ministry there? What were the difficulties and joys that awaited you? —The first and main difficulty was the divisions in the parish and antagonism among rival groups within it. I became conscious that supporting one “group” would mean “being against everybody else”. So I did my best to be impartial, treating all the rivals equally, concerning myself only with the growth of the community and the increase of the number of services. I wanted to attract new people who would avoid the conflicts and factions to be the nucleus of the parish, and form the basis of a healthy parish life. —Austria is steeped in history and culture. Were you imbued with the spirit of this country and its people? —The richness of history and culture is a great source of self-education. A long-term stay in a foreign country allows you to learn a lot, and to make an objective evaluation of the tendencies in development of both your country of residence and your native country. When you see how much Christianity gave to these lands, your faith grows stronger—though it really distresses me to see how quickly people can forget the source of their prosperity. —What is the ethnic composition of your parish? I reckon that most of the parishioners came from the lands that historically constituted a part of Russia? —Not only Russia. Our “family” consists of Russians, Ukrainians, Belarusians, Serbs, Georgians, Austrians, Poles, Bulgarians, and Macedonians. —Austria is a Catholic country. Do you get along with the local clergy? —The relations at our level are excellent. We have a lot to learn from them, especially in such spheres as social and prison ministry. —Do you know any Austrians who converted to Orthodoxy? —Yes, I do. But in most cases these are spouses in mixed marriages. 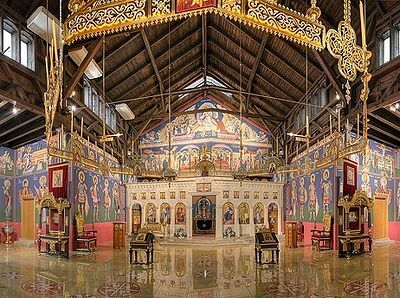 If you are not just nominally Orthodox, then your other half converts and becomes a church-goer, inspired by your faith and devotion. But we have seen the reverse as well: Someone who is nominally Orthodox marries a practicing Catholic and without a moment’s thought defects to the spouse’s “denomination”, though afterwards this “convert” often comes to his or her senses and seeks the way back to Orthodoxy. — In 2012, Sebastian Kurz, the incumbent Federal Chancellor of Austria, visited St. Nicholas Cathedral. What can you say about the relations between your parish and the authorities of Austria and its capital? We are keeping in close contact with our municipal and district authorities. Every spring we organize a festival near the cathedral together with them and the Russian Embassy, which is open to the whole diaspora and local residents, and unites our community. I hope our congregation will have enough strength and enthusiasm to carry on this joint work. —Fr. Vladimir, what would you like to pass along to our readers in conclusion? —I wish them joy, an unquenchable thirst for faith, prayer, truth, and justice; for youthful zeal in their undertakings, maturity in decision-making, persistence in achieving their goals, and for peace and happiness. 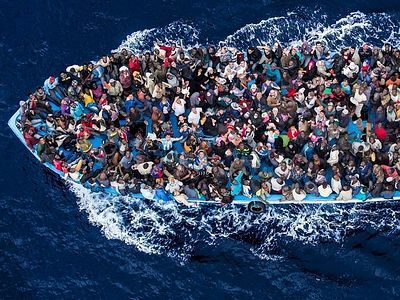 Igumen Daniel (Irbits) on the new “migration of peoples” "To remain Christians. If we can manage…"
The arrival of thousands of refugees, migrants and settlers from Africa and Asia to “the Old World” is already being interpreted by many Europeans as a catastrophe, a curse, and a real challenge not only to the culture, economy, and the Christian faith of the continent (which is still alive, though is becoming very weak), but, therefore, to the very existence of the continent and its native inhabitants. What should Europe do not to be afraid?